Will floating PV start trending? NREL estimates its potential in the U.S. While the United States was the first to demonstrate floating PV panels — with the first installation occurring 10 years ago on pontoons on an irrigation pond in Napa Valley, California — the idea has not received widespread national acceptance. The U.S. focus has primarily been on installing large-scale, ground-mounted solar panels, and only had seven floating PV sites as of December 2017. Floating PV sites are being deployed more overseas, however, with more than 100 sites as of the end of last year. Japan, for example, is home to 56 of the 70 largest floating PV installations. Macknick and his NREL co-authors, Robert Spencer, Alexandra Aznar, Adam Warren, and Matthew Reese, estimate about 2.1 million hectares of land could be saved if solar panels were installed on bodies of water instead of on the ground. The use of floating PV comes with additional benefits, including reduced water evaporation and algae growth. 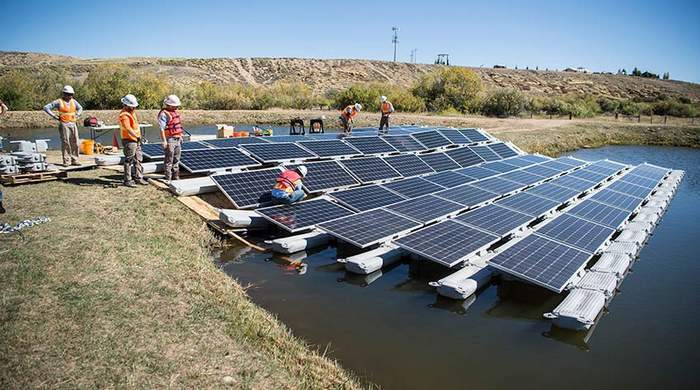 The NREL team also found that operating floating PV alongside hydroelectric facilities yields increased energy output and cost savings because of existing transmission infrastructure.